Taekwondo athletes from South and North Koreas staged a joint performance at the Olympic Museum in Lausanne, Switzerland, Thursday (local time), to commemorate the 25th anniversary of the martial art becoming an Olympic sport. 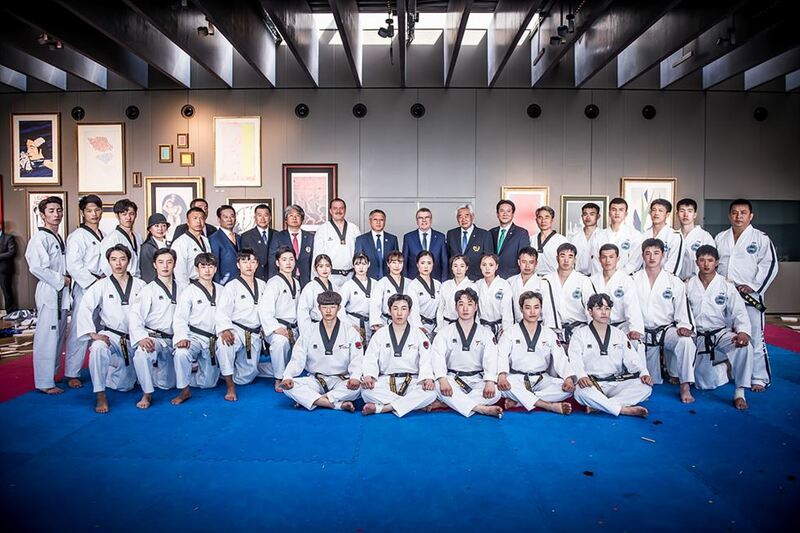 The World Taekwondo (WT), under the leadership of South Korean Choue Chung-won, and the International Taekwondo Federation (ITF), led by North Korean Ri Yong-son, gave a joint demonstration in front of more than 100 people, including International Olympic Committee (IOC) President Thomas Bach. According to WT, the event was held also in recognition of the sport's other contributions to the Olympic Movement, including innovative rule changes and the promotion of human rights and peace-building initiatives over the past 25 years. Since the 103rd IOC Congress in Paris voted to include taekwondo in the 2000 Sydney Games, it has appeared at every Olympics. Other distinguished guests included former German Chancellor Gerhard Schroder, Association of Summer Olympic International Federations President Franceso Ricci Bitti, IOC Executive Board Member and United World Wrestling President Nenad Lalovic, International Handball Federation President Hassan Moustafa and International University Sports Federation President Oleg Matytsin. Twenty-eight 28 WT delegates and 23 ITF delegates took part in the performance, which featured acrobatic kicking skills, self-defense demonstrations and poomsae. "Today's event was an important milestone in taekwondo's history. It is an honor to have been included on the Olympic Games program for the last 25 years," Choue said. "We take our commitment to the Olympic Movement very seriously and I would like to thank IOC President Thomas Bach and the IOC for their continued support. "During that time, we have seen taekwondo grow significantly thanks to the global exposure the Games has provided … We have innovated the sport, made it more exciting for athletes and fans and ensured that it can be practiced anywhere, anytime, by anyone regardless of age, gender or ability." He reaffirmed his commitment to promoting Olympic values around the world. "We are committed to fulfilling our social responsibility and making a major contribution to social development and humanitarian causes. Working with the ITF, we are aiming for 'One World, One Taekwondo,'" he noted. Ri said the joint performance would be marked in history. "This day also marks the 64th anniversary of birth of Taekwondo," he said. "With the profound philosophy and characteristic spirit of Taekwon, ITF has devoted itself to building up civilized human society and will continue its cause in conformity with the goal and purpose of Olympics to encourage and contribute to the construction of peaceful human society, which ensures the dignity of humans." Bach said he was impressed by the performance and the development taekwondo had made under the leadership of Choue and Ri. "Ever since taekwondo became an Olympic sport, WT transformed a Korean martial art into one of the popular sports in the world," he said. "I wish to thank taekwondo for demonstrating the power of sport in contributing to peace. I hope these two organizations will continue collaboration as committed in Nanjing, China, in 2014."